AECinfo.com News: Functional and Stylish Bike Parking Design from Reliance Foundry Co. Ltd. Effective site design offers functional integration to support growing populations, greater density, and new interests in alternative modes of transportation. 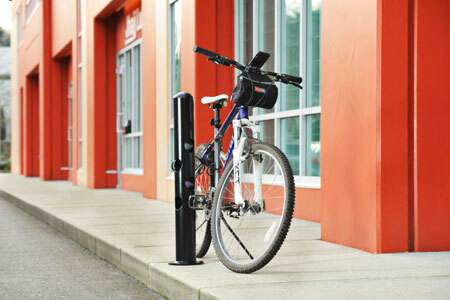 Reliance Foundry’s R-7972 Bike Bollard complements modern developments in dense urban areas. It features a slim, eclectic design ideal for establishing clear vehicle barriers, unobstructed pedestrian flow, and secure bike storage. Create harmony between form and function—ensuring safety and usability while enhancing unique building and landscape aesthetics. The R-7972 Bike Bollard offers secure bike parking with an attractive, minimalist design and requires only one installation point for paved surfaces. Internal cavities are compatible with both U-lock and cable-style bike locks—supporting storage for up to two bikes of varying sizes and styles. Bike posts can be installed with fixed mountings in new or existing infrastructure. They can also be installed with removable mountings to suit temporary or seasonal accessibility in multi-use or changing-access environments. All bollards are powder-coated to ensure durable, lasting performance free from rust and corrosion. The R-7972 Bike Bollard features a slim, eclectic design free of protruding locking arms—suitable for dense urban areas. It balances the standard functionality of a pedestrian bollard, segregating vehicles from unobstructed foot traffic, while offering unique and secure bicycle storage. Cylindrical cavities pass through the vertical shaft to accommodate chains and U-locks to secure up to 2 bikes at a time. Cylindrical holes are angled to prevent collection of dust/debris and are spaced to accommodate bikes of varying sizes. R-7972 Bike Bollards can be installed with fixed or removable mountings in new or existing concrete. Bollards are powder coated in 1 of 6 standard colors.